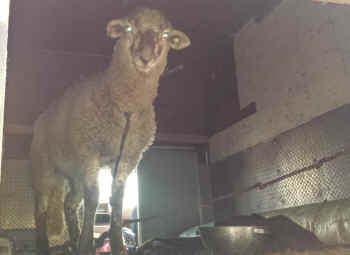 Tethered and hobbled in a box truck located on 27-acres of impounded vehicles, little G.G. must have felt alone and afraid. The only human she knew had chained her inside the truck, barely offering her enough food and water to survive. Wasting away, G.G. 's only means of expressing herself came in the form of stomping her little hooves. The owner of the impound center, Bob Connor noticed a rank smell from a truck. He peered in and saw nothing. Assuming someone had dumped garbage in the vehicle, he walked away. Then he heard the staccato stamping of something or - in this case someone - and investigated further. Those stompy, angry hooves are reason #1 G.G. wins at life. Had she stayed silent, her fate would have been different. G.G. is only 5-7 months old...it is likely the person keeping her planned on killing and eating her. G.G. is one reason we invite you to donate to our annual Rescue Medical Fund, which is used to transport, feed, and care for newly rescued animals. An email from our friends at the East Bay SPCA alerted us to G.G. 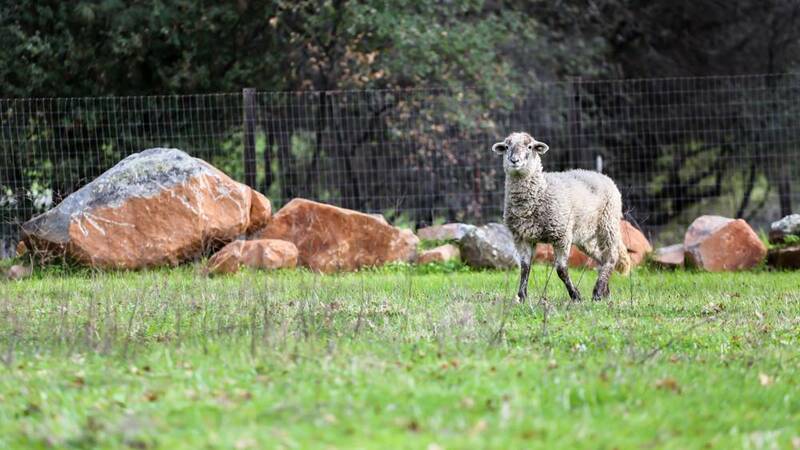 Within hours, plans were made to transport her to our Grass Valley sanctuary. Mr. Connor made it his mission to see G.G. safely to Animal Place. G.G. arrived and found herself in a gorgeous, green pasture...it was her first time touching grass and running free! We immediately noticed reason #2 G.G. wins at life - her tail! Did you know most farmers cut off the tails of lambs when they are only 1-10 days old? Lucky for G.G. she keeps her tail and can compete with Aiden for "best looking tail." Reason #3 G.G. wins at life? Being free. G.G. raced across the pasture and spent hours investigating her new home. 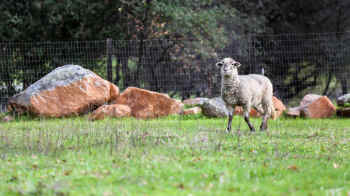 And soon, she will meet other sheep and learn what it is to have family. For G.G., it took one person to transform her life. It took one person putting their compassion into action. G.G. is malnourished and may suffer from internal parasites. She will be evaluated by a veterinarian while we ensure she is well-fed. This holiday season, G.G. 's freedom is the best present! Donate to the 2015 Rescue Medical Fund so that animals like G.G. can continue to be rescued and cared for at Animal Place! If you see cruelty toward animals, take action! Document the cruelty and report it to animal control. Be persistent - their lives may very well depend on your tenacity. Use alternative fibers, like organic cotton, hemp, or flax instead of wool. Not only do sheep have their tails cruelly and painfully cut off but all sheep are sent to slaughter when they are only 2-4 years old.